The Posiflex KS6215 uses the same patented fan-free aluminum chassis design as the KS6315 Series for optimum heat dissipation. Configurations include a 1.5GHz VIA C7 Processor with 128KB L-2 cache. The base stand allows for improved cable management and includes a secured "pull-out" 2.5" 80GB STA HDD at the front panel. 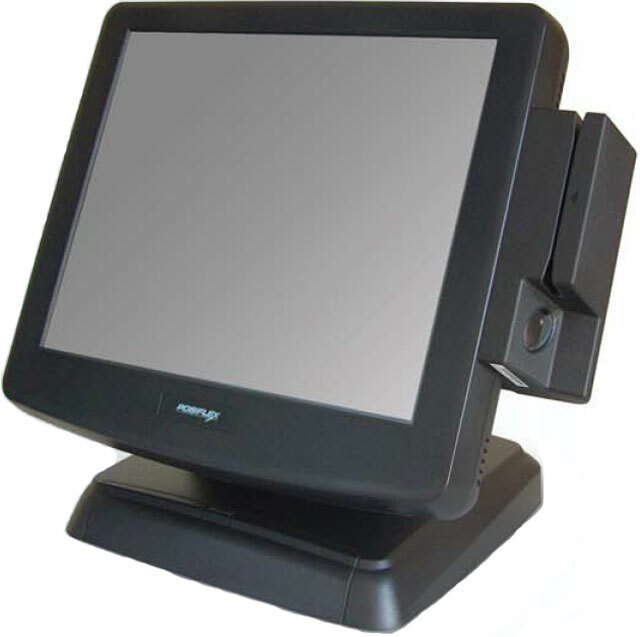 Systems include: 2 DB9 Serial Ports, 4 USB 2.0 Ports, a Cash Drawer Port and more! The 15" LCD includes a textured bezel and front bezel illuminated logo that can be customized. The Posiflex KS6215 is both base stand and wall-mount capable. (Wall-mount plate is optional.) Additional HDD cavity with SATA HDD interface cables available in main unit for easy transition from a base stand to wall mount. The Posiflex KS6215EXAWXP is also known as Posiflex Business Machines	POS-KS6215EXAWXP	.